During spring 2011 we were working with Ateneum Art Museum and made a happening “120min MUSE/UM”, which lasted for two hours in a Friday evening on May 2012 in the centre of Helsinki. In this happening a group of art students were working outside the museum walls by presenting and projecting thematic ideas on museums. The idea was to transfer the public space into a living museum for two hours. The idea was also to take art among the people instead of people going inside a museum. The project was extending the museum space outside the museum space. The group of students were also questioning the expectations of objectivity, which is often associated with museums, with their own subjective ideas. 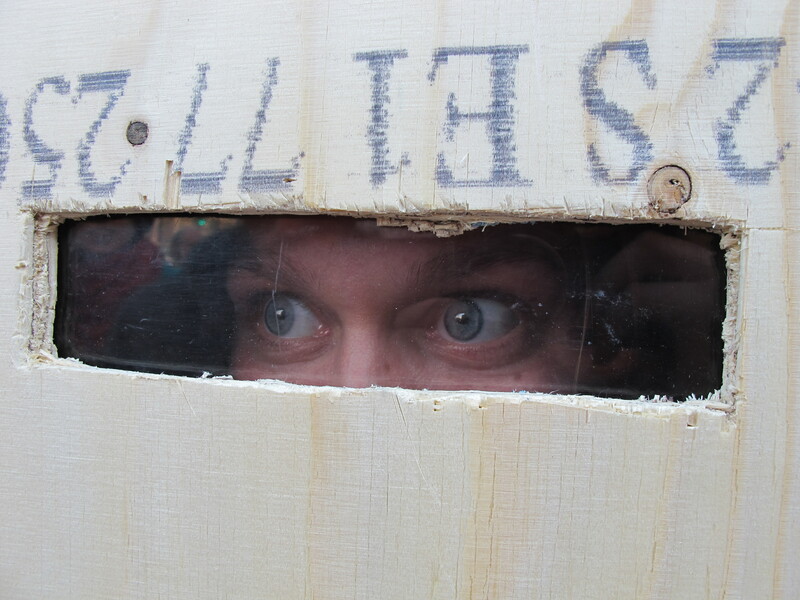 One of the students, Emma Fält, stayed inside a cardboard transportation box for 120 minutes. You could only view her eyes through small eyeholes. “Dropping out means leaving a group for either practical reasons, necessities or disillusionment with the system from which the individual in question leaves. It is used in various contexts.” (Fält, 2011)There were also other students, which played the role of museum guards, guarding the area. The students works demanded attention from the passing by walkers, by bringing the museum habits into the street. One student, Sara Munguía even sat for two hours on the lap of the huge statue of Finnish National writer, Aleksis Kivi (1834-1872), in the railway station square. Another student, Fatmir Mustafa-Carlo, walked with huge cardboard male models pictures from the Post museum to the Ateneum museum. The surrealism of the event created confusion and laughter among the people on the street.